Ever wonder what happens to all the wool from Lopez sheep? For the past year and a half, a lot of it has ended up with Maxine Bronstein and Debbie Hayward at their Lopez business Island Fibers. 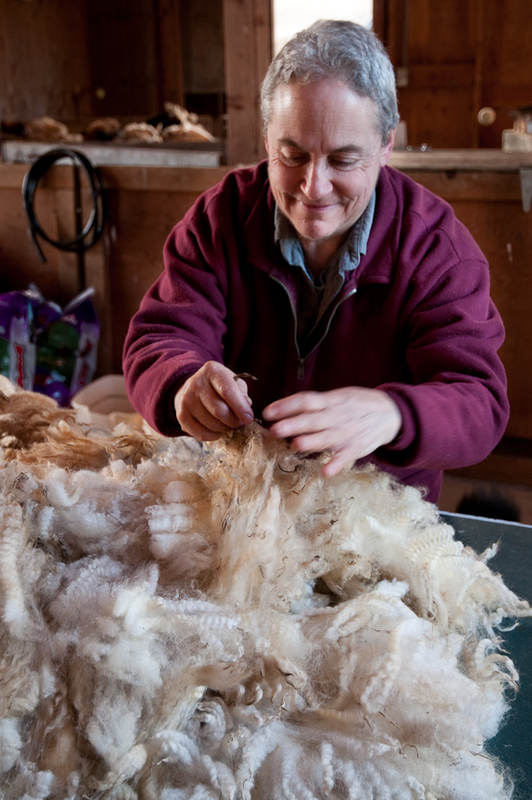 I spent a morning with them in their studio recently and discovered their passion for Lopez fleece and the pleasure they find in transforming local fleece and sharing it with others. “There’s such a variety of fleece on Lopez and the quality here is excellent,” Maxine and Debbie told me as they pointed to large bags packed with white, gray and brown wool. “From among the many breeds of sheep found on the island, we are using fleece from the purebred flocks of Romney, Coopworth, Icelandic and Navajo Churro. Each type of wool has characteristics that make it especially suitable for a specific purpose—from fine fiber for soft garments worn next to the skin to the coarser, strong fibers that make excellent rugs and weather-resistant outer clothing.” They also use fleece from a few mixed flocks on the island that have been bred specifically to produce beautiful fleece for hand spinners with colors ranging from off-white to dark brown. The process of transforming the fleece begins at shearing. “We go to each farm at shearing time, pick up each fleece, spread it out and skirt it, removing all the undesirable parts.” Later they sort the fleece according to the kinds of yarn they want to make and send it to a mill for spinning. “Or if the fleece is just so beautiful we can’t part with it, we’ll keep it to spin ourselves,” they said laughing. Island Fibers offers a range of natural-colored yarns, as well as their own hand-dyed and hand-painted colorways (variegated and multi-shaded yarns). Handspun yarn is also available. “People see what we do and say ‘Wow, I didn’t know what it takes to go from the sheep to the yarn; that must be a lot of work.’ We answer that it does take a lot of time, but it doesn’t feel like work. Everything has to be washed many times: the fleece, the yarn that comes back from the mill, the dyed wool. Every single skein is touched many, many times and that’s before making anything out of it.” Many more hours go into creating rugs and blankets, sweaters, mittens, socks and hats.